A hog scraper is the easiest way to remove hair from hide when butchering hogs. What home butchers need for simple pig hair removal. After scalding the bell scraper removes hair. Firmly hold the hog scraper with two hands and use pressure to scrape the hog from the front to the tail. 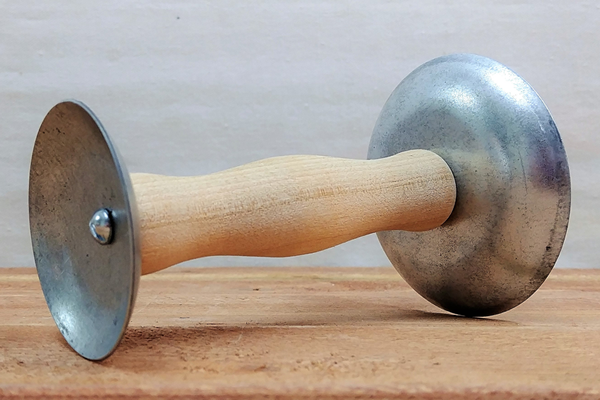 The bell scraper is used at an pulled toward the user during scraping. Most butchers begin with the head and legs; these areas are the hardest and are easiest when done promptly after scalding. Stretch the skin or move the hog's legs to make scraping easier. If the hair is difficult to remove it usually indicates the hog has not been sufficiently scalded. Once the hair is removed rinse with warm or hot water. This hog scraper is easily sharpened with a file or emery wheel. Our hog scraper features a sturdy wooden handle. Large Bell Diameter: 3 1/4"
Small Bell Diameter: 2 3/8"